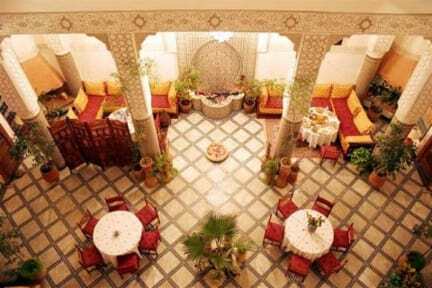 Riad Dar Dmana is an ancient mansion family home located at the heart of the medina of Fez. It has been totally restored with passion and talent while respecting the traditional architecture and paying tribute to the specific crafts of Fez. Riyad Dar Dmana Fez is not a hotel. It is rather to be understood as a refined and elegant house. Khalid and Abdou, the two owners, as well as their caring staff, welcome you to a home atmosphere. The gurgling sound of the fountain, the authenticity of Iraqi glass, the delicate carved plaster, the colorful Zelij tiles and the old glass panels are stunning. Riad Dar Dmana Fes is your home. It is a place to relax, enjoy and meet people. 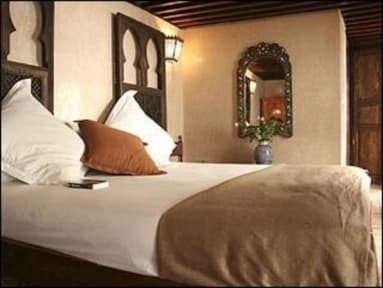 All rooms and suites at Riad Dar Dmana are equipped with hot water showers, air conditioning, TV, a satellite dish and phone. A hammam (Turkish bath) is also at your disposal as well as a planted terrace where you can sit and enjoy a cup of mint tea. Typical Moroccan meals are served in the andalous patio with candlelight and two fire places. You will certainly remember Fassi cooking as a landmark in your culinary experience. Parking watched around the clock 50 m from the Riad. Free pick up from the train station. Free pick up from the airport for one week stay.